The Department of Chemistry and Industrial Hygiene offers two major programs: a chemistry major program and an industrial hygiene major program; and a chemistry minor program. Those majoring in chemistry may choose from the professional chemistry option (intended for those interested in graduate school or being an industrial chemist), the general chemistry option (intended for pre-professional students), or the professional biochemistry option (intended for those interested in graduate school or medical profession). We also provide courses that fulfill the subject requirements for those seeking certification for secondary education in chemistry through the College of Education and Human Sciences. 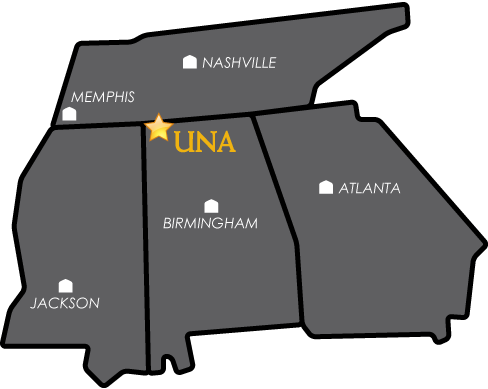 In addition to any financial aid that a student may receive from UNA or other sources, the Department manages its own scholarship program. Incoming freshmen and transfer students majoring in professional chemistry or industrial hygiene may apply for an endowed scholarship which provides funds for up to four years. Also, UNA students currently enrolled and majoring in chemistry or industrial hygiene may apply for renewable, one-semester scholarships.